Greetings from lovely Toronto; setting for Canada's most prestigious film festival. My Twitch teammates have been incredibly gracious; Todd Brown picked me up at the airport and Andrew Mack has provided me a place to crash, but, more importantly, a place to fix myself a strong cup of coffee every morning!! Mack lives in Steeles Corner in northern Toronto, where it's quiet, the gardens are beautiful, the dark-furred squirrels wear boxing gloves and several of the streets have no sidewalks; pedestrians and cars live in symbiotic unity. Further, Mack's home is a short walk from the Finch Station, last stop on the Yonge bullet train which whisks me downtown to TIFF. Yonge is allegedly the longest street in the world, and the metro is amazingly accessible. The day transit passes look like lottery scratch cards and the music in the metro tunnels is of high caliber since musicians must audition for the requisite licenses. I was expecting the locals to have accents but they actually speak an American twang so I feel right at home. First day here Mack took me on a dry run, showing me how to get around on the metro, and familiarizing me with TIFF's various venues so that yesterday morning, I started right in, cued by Best Bets to rush down to the ticket office to secure tickets for Hana and Ten Canoes, which had previously appeared as sold out. Best Bets is a great service that alerts you to all the tickets that have been poured back into the system on the morning of any desired screening. There's always the rush line, of course, but Best Bets is a bit more secure. I caught the very last ticket for Ten Canoes for example. Hirokazu Kore-eda's latest, Hana, is an unexpectedly humorous and effective inversion of the samurai genre, veined throughout with warm humanity and a brilliantly contemporary perspective for being a historical period piece. Its comedy is achieved not only through an ensemble of randy and meticulously-drawn characters living in an Edo tenement slum, but by its upset of expectations regarding the samurai code. What is truly the pathetic comedy? A samurai who is clueless at tracking and inept at swordplay? Or a samurai so driven by code that he forfeits the pleasures of being a husband and father? And who most honorably fulfills a father's dying wish to have his death avenged? A samurai warrior who interprets revenge as bloodlust and, if necessary, suicide? Or one who realizes that to teach the young propels the world forward? An admitted response to 9/11, Hana leans toward peace in times hungry for war. 09/09/06 UPDATE: Both Todd and Opus have written fine reviews of Hirokazu Kore-eda's Hana for Twitch. Here is my transcript of the Q&A with the director after the film's first TIFF screening. Prefacing that the film, although a period piece, addresses contemporary issues, Kore-eda was asked why he decided to set the film at the turn of the 18th century and what attracted him to the samurai genre? He stated that initially he came up with the idea after 9/11 when the spirit of vengefulness was at a peak. He wanted to make a film with the theme of revenge, but, he wanted it to be a comedy or to have comedic elements. He then wondered what the film might be like if it was about a samurai who was compelled to avenge someone's death but who really didn't want to? Also, currently in Japan there is a resurging obsession with the samurai warrior code, which makes Kore-eda uncomfortable. He wanted to somehow address these patterns of vengefulness appearing once again in human history to comment upon how they interfere with peace. He was asked about the cinematic citation within Hana to Kenji Mizoguchi's Genroku chushingura / The 47 Ronin. He responded that people of his age around the New Year usually watch this film about the tale of the 47 samurai who avenge their lord's death. It's a tale very familiar to people of his generation. With regard to the film's title--Hana--which is the Japanese word for flower, Kore-eda explained that the full title of his film is Hana yori no naho which roughly translates as "something more than a flower" so, in a way, the Western abbreviation of the title is misleading. The lord of the 47 ronin who committed suicide allegedly left a note indicating his regret in the metaphor of a flower and Kore-eda was playing with this metaphor. Throughout the film samurai are associated with cherry blossoms and there is some discussion that the beauty of this equation is that samurai, like blossoms, must die. However, Kore-eda adeptly offers a counter-interpretation that what is beautiful about the cherry blossoms falling is that they will return the following spring. Death, then, is seen as something like the middle of a long life and not an end in itself; certainly not a goal in itself, which is often the predictable trajectory of the samurai code. Further, Kore-eda was asked if there was any significance to the fact that Soza's bird was named Hana and that it is eaten by a cat. Kore-eda complimented the questioner's hearing because the bird's name was indeed Hana but was not named in the subtitles. He wanted the reference kept subtle and admitted he had, perhaps, his own reasons for naming the bird Hana, which he declined to expand upon. One of the true delights of the film, lending to its comic atmosphere, is the film's music. Asked about the music, Kore-eda responded that he wanted to use music that no one would expect to hear in a samurai film. He employed a group of musicians who play with antique European instruments from that era. He wanted to use music that would have been contemporaneous in Europe to the time the film is set in Japan. Asked about the set design for the tenement slum in Edo, Kore-eda admitted he has never done a historical scientific study of how many people lived in abject poverty at that time. He did discover that at that time they hadn't yet developed the technique for building houses on a slope so, in a way, this representation in his film might be inaccurate. Then again, his set design was in response to his frustration with how sturdy and well-built the houses of poor people are in most samurai films so he purposely encouraged his set designers to make the tenement slum as shabby as possible. 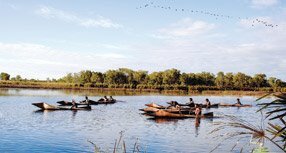 The second film I saw yesterday was Rolf de Heer's ethnographic photograph come to life: Ten Canoes. Winner, as I understand, of a special mention at Cannes and already announced as Australia's entry into the Oscars foreign film category, Ten Canoes is visually stunning as it shifts between real time and dream time through strategic shifts between color cinematography and black and white cinematography. The story is simple even as the storytelling is complex. While hunting for geese and geese eggs, an elder tells a younger man a story that proves relevant for his own inappropriate feelings for his brother's wife. 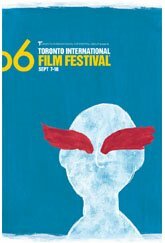 What became of tremendous interest at the screening I attended was that the print sent to TIFF did not include subtitles! This outraged some even as it delighted me for being so sensually immersive in the aboriginal language. Though (thankfully) the storyteller's narration was in English, de Heer was horrified and deeply apologetic during the Q&A and said as an audience we had missed a lot by not having the subtitles, and I'm glad that in a couple of weeks I will have an opportunity to see Ten Canoes again in the Bay Area to compare and contrast, but surely this is an indication of how accomplished the film is that I could have enjoyed it so immensely just for the imagery and the hypnotic cadence of its language? 09/09/06 UPDATE: During the Q&A after the screening, Rolf de Heer was asked how he cast Ten Canoes. He responded by saying he would have to paraphrase the question: how the film was cast. It was the most remarkable casting process he'd ever been through. In many respects he could do little. The inspiration for the film was a photograph by the Australian anthropologist Donald Thomson of ten men in canoes on a swamp. The initial casting of the movie was for four of those ten. It was really the community itself who moreoreless decided who was going to do what. The ten men in the canoes in the photograph were all named and everyone was related to them in some way and so the people who were most closely related chose to "be" them. The last of the ten canoeists were cast in that way. For the rest of the casting, a number of aspects came into play. Primarily, there is a complex kinship system where everyone belongs to one of two moieties with subsections and classifications that determine who can marry who. As far as he could understand it, in the aboriginal culture there is no concept of "fiction." Thus, the relationships on the screen between the characters had to be allowed in real life between actors playing those characters. This was so complex that there was nothing he could do to even determine who he could cast from. It didn't work for him to ask each actor which moiety they belonged to and try to figure it out from there; they moreorless determined these casting choices themselves. He had to concede to their cultural imperatives. He was asked how Australians and the aboriginal communities reacted when they saw the finished film. The very first people to see the film were the aboriginals who saw the version that was completely in their language, including the storyteller's narration (in our version the narration was in English). It was the wildest screening he had ever been to. It was complete madness, chaotic, wonderful. It was the first time any of them had seen anything on the screen that was about them in their own language. There was yelling, screaming, laughing. The response was tremendous. He was asked how he came about to write this story, to know this community, and to become so involved, and whether he spoke aboriginal. Not at all, he admitted, maybe five or six words. It started when he made a film called The Tracker and he cast David Gulpilil [who, incidentally, is the English-speaking narrator of Ten Canoes]. After he cast David, he found himself not knowing how to deal with him because he was so different from anyone he'd ever dealt with before. He didn't even know how to talk to him. David invited him to come meet his people and de Heer realized he had to accept that invitation so he could understand him better to direct him. As their relationship developed during the filming of The Tracker, David kept asking de Heer to make a movie that would be about his people starring his people. As the project developed, David himself moved away from his community and became distant from the project, but, by then de Heer had developed a relationship with everyone else in David's community. Almost three years ago to the day when de Heer was in Toronto for Alexandra's Project he was walking across one of Toronto's parks ruminating on Ten Canoes when all the contradictory elements of the script's thematic necessities and cinematic structure fell into place. In gist, the story of ten men hunting for geese and geese eggs was fundamentally undramatic but this was what the community wanted in the film and what he had to work with. The community was very attached to the Donald Thomson photograph and they wanted de Heer to bring it to life. They wanted the film to be about old times but they didn't want the old times to be depicted as a time of conflict. Because Thomson's historical photograph was in black and white, it seemed obvious that the recapturing of that image should be in black and white but he was under contract to deliver a film in color. It was while walking through the park in Toronto three years ago that de Heer figured out that if the film was set in mythic time when anything could happen, it would be sufficiently removed from historical old times, and could be contrasted by being shot in color. If the mythic times could be told by a storyteller as the old times geese hunt was occurring, then the film would be provided a dramatic structure that would make it compelling to western audiences while still satisfying aboriginal requests. Because of his familiarity with the community, de Heer was asked if it has changed much since he first met them. Some aspects remain close to what he first encountered, they retain tribal customs even as some of the aborigines have become enamored with on-line banking. The script was developed by de Heer sitting down with the aborigines, talking through each scene, discussing what needed to be said to further the scene, complicated by his inability to speak Aborigine and many of them unable to speak English. There was always a lot of talk before they could finally get down to a shoot. Despite all this complication, the performances are amazingly consistent and de Heer explains this as being a consequence of the aboriginal perspective that they were not playing their ancestors, they were their ancestors. This temporal aspect is difficult for Westerners mired in temporal tense to understand. Comparable to the aboriginal assertions that they are the land and the land is them. The western subject/object split, which we presume to be literal, collapses in the face of the aboriginal belief in their own literal connection. In being their ancestors, they could do it with relative ease and continuity. It's great that you're able to begin your reporting so soon, Michael! Sounds like a couple of winners so far. I've never seen a De Heer film before but Ten Canoes sounds like a must. When I was living abroad there were few opportunities to see English-subtitled films, so I fled into immersion in the English-language films available. I don't think I've ever had a period of film viewing more densely packed with Hollywood would-be blockbusters than that year and a half. Finally toward the end of my stay I was fed up enough to try doing some unsubbed viewing (having learned a bit of the local language helped). I learned that if a film is visual enough, it can be just as powerful without understanding words. I'm looking forward to more TIFF reports from The Evening Class! So far you're 2 for 2 covering films that no one else (that I'm reading) has posted about. Hey guys, thanks for checking in! Apparently the press screening for "Ten Canoes" was canceled due to the festival having the wrong print. Another's been ordered I guess. Without question, the film was strong enough on its own merits, but, I had the good luck of not knowing what was missing. I think it'd be a different viewing experience altogether knowing the subtitles were supposed to be there. Andy, hoohoo!! Glad I'm covering some of the more obscure pieces. At least the shift of color/B&W helped to figure out the flashbacks. Thanks a lot for the very insightful Q&A transcript, Michael. This is a really unique film, and its making too is. The opening sequence (in English) does tell this special bound they have with nature, they are born of a pond and return to it before re-incarnation. Oh believe you me there was QUITE the commotion after the screening. But whether or not anyone went to the manager to ask for their money back, I'm not sure. We should have least gotten $10 out of our $22 back, don't you think? $22? these gala screenings are so expensive. I don't know how much it costs in Cannes, but in Paris "festival tickets" are usually cheaper (half-price) than the regular fare. But I meant that when we realize the dialogues aren't translated there is always someone getting up to complain to start over the film with subs. I'm like you I wouldn't have minded, for experience sake. But some cinephiles are a little nitpicky. Harry, that isn't Gala fare; that's everyday fare. My understanding is the gala tickets veer into the $30 range. Canadian or american dollar? (Well sorry for the digression) Everyday fare here is 7 to 10 euros, and the public admission at festivals is usually 4 to 6 euros (although there isn't any major festival in Paris of international scope). Otherwise I would never see as much movies!